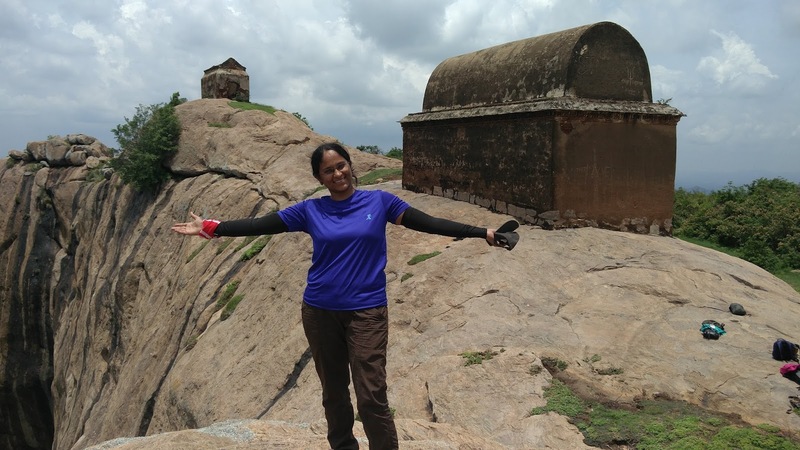 When I saw the post from BTC, WOW trek to Rayakottai, registered immediately giving it no second thought. 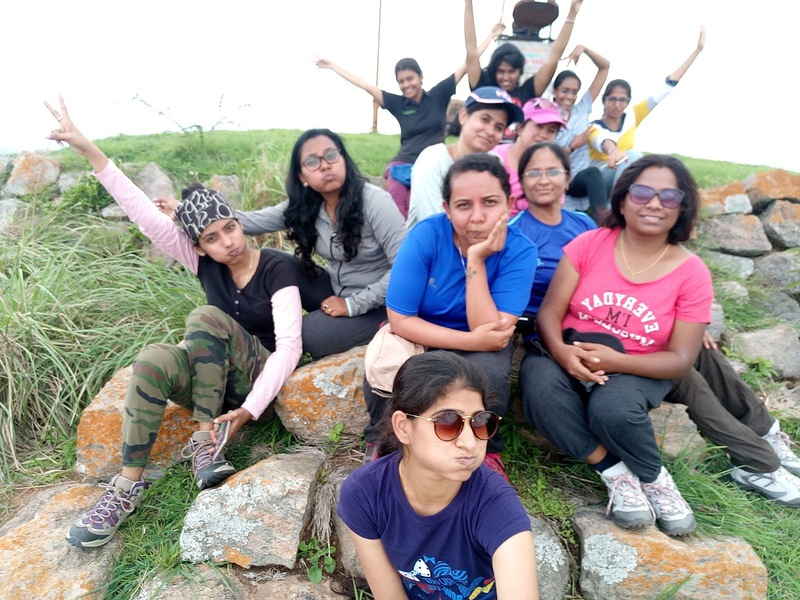 I am happy that I registered soon since there was a record time response for WOW trek this time and registration for the event closed within a day. Monsoon is on rage these days in Bangalore and on Saturday morning wee hours, it started pouring heavily just before hours of our departure. 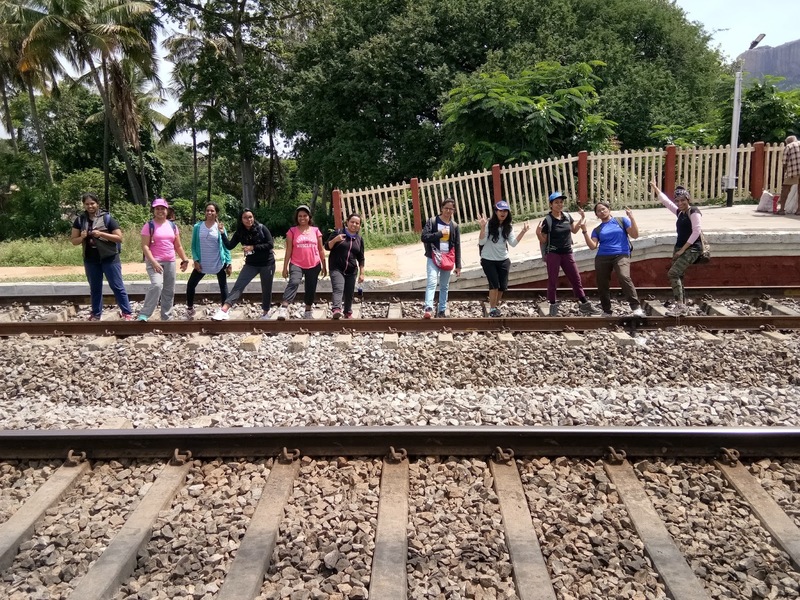 Plan was to gather in Majestic railway station at sharp 6.30 AM or in Baippanahally railway station at 7.15 AM. There was no sign of rain stopping and few of them had to drop out because of unavailability of cabs and water logging in certain areas. Shilpa and Bharti, organizers, started taking poll and for me it was the dilemma to choose between trek and cozying up in the bed with no cabs/autos nearby. When there was a positive response from all the girls for the trek I cursed my lazy thoughts, pulled off my trek gear and managed to reach Majestic railway station by 7AM. We boarded Train which was scheduled to depart from Majestic. 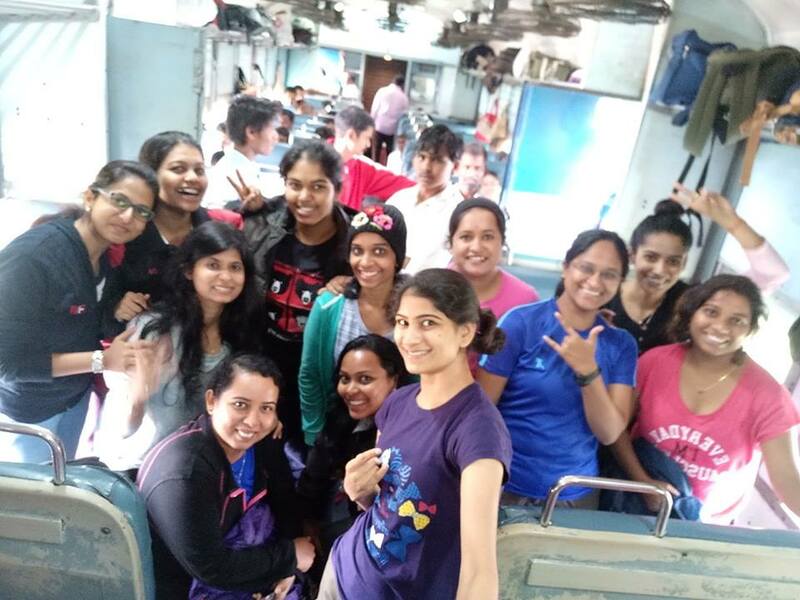 We found a compartment which was all empty and were later joined by girls from Baippanahally railway station. Everybody had reached braving rains or uncertainty over availability of cabs/autos. 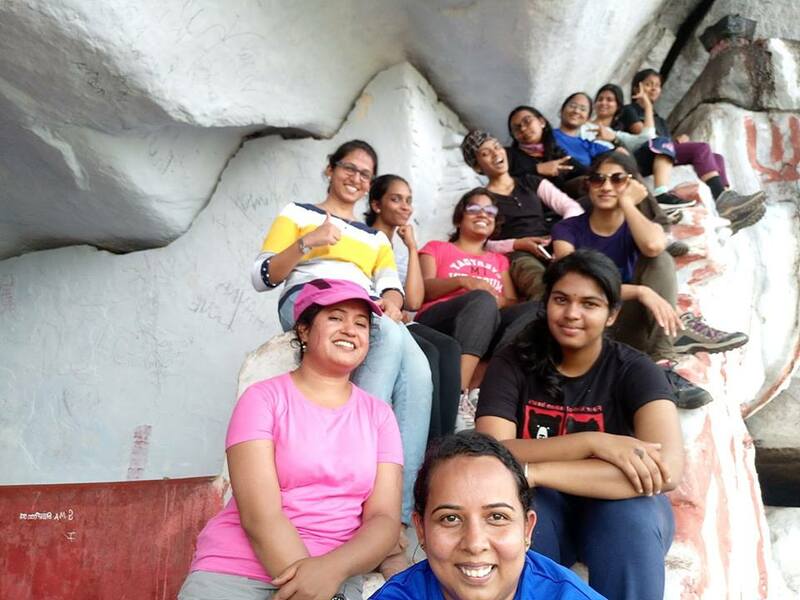 Kudos to all girls who made it to the trek in spite of all the hurdles. 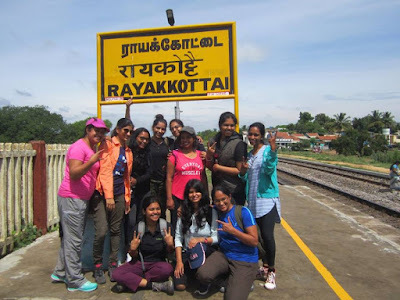 We reached Rayakottai station at 10.30AM. If the weather in Bangalore was razed by monsoon it was a blazing hot day in Rayakottai. 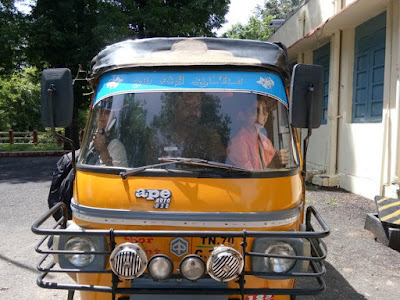 Shilpa and Bharti briefed do’s and don’ts then we boarded an auto to reach the base of the hill which was 2 Kms from station. 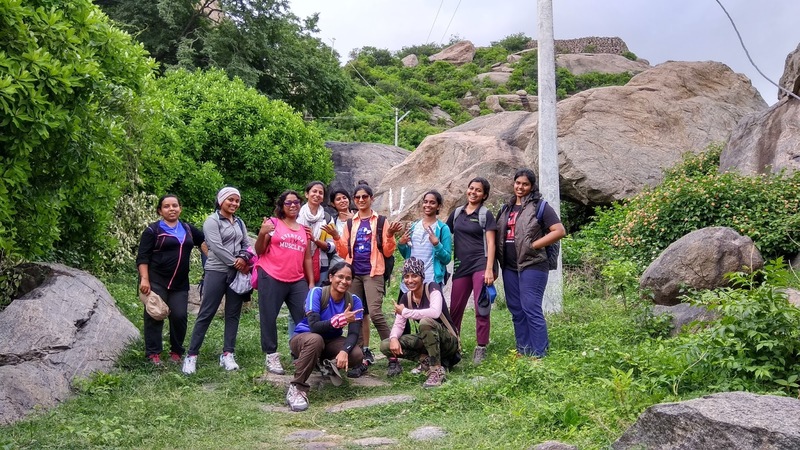 We started our trek, Shilpa leading and Bharti in the trail - we all comfortably followed organizers. 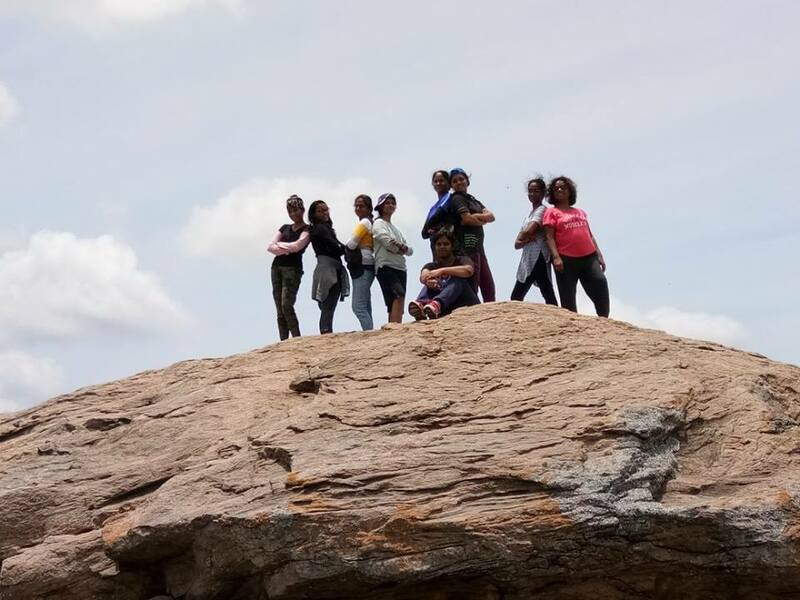 Trekking along rocky patches and small boulders, with thick bush vegetation surrounding on both the sides, the view got better from each climbing step. 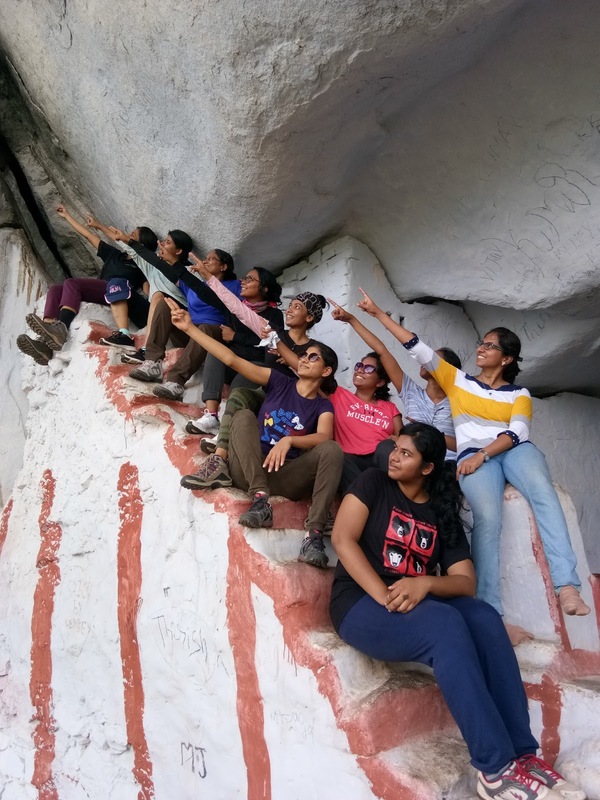 We clicked lot (read it lot n lot n lot n lot….) of pics all through the way. Along the way to the top, we encountered fort wall ruins and small caves with a good backdrop. 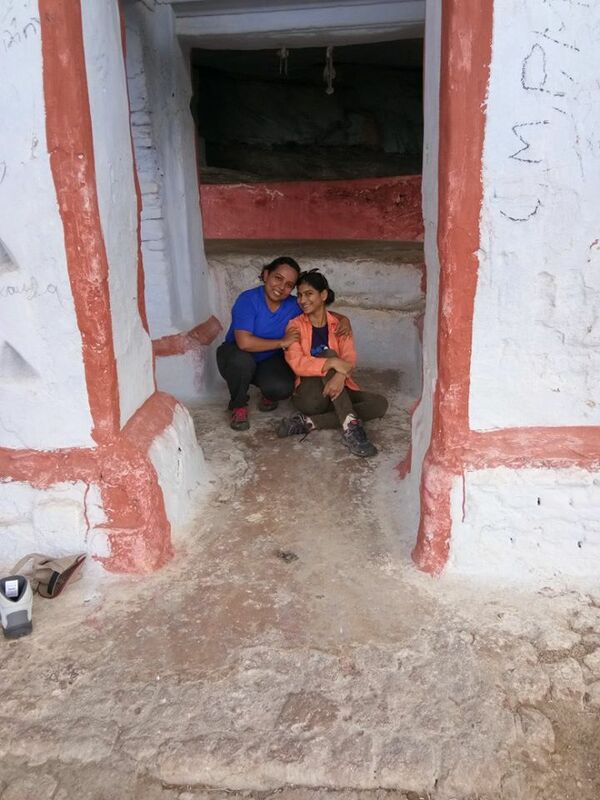 We reached a small cave temple and it was very relaxing there. 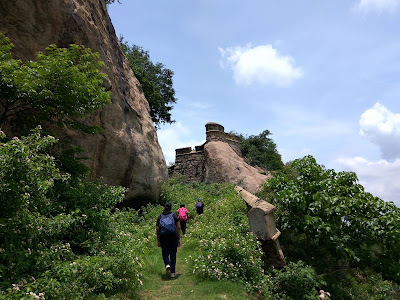 On climbing further up, we saw old fort ruins, may be they were used as warehouses to keep ammunition/grains and also as stallion and guard resting houses. They are all in ruins now, but if ASI (Archaeological Survey of India) puts up a board there it will be very informative. 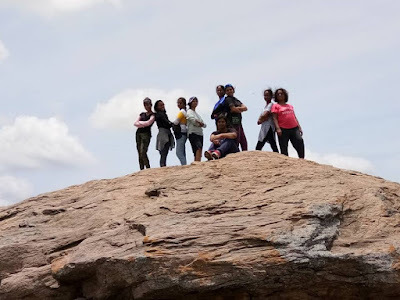 We reached the peak point and one can have a 360 degree view of the surroundings and also we could see many rocky hillocks surrounding the area. Strategically no wonder why Tipu Sultan chose this place to build this fort. It started getting very hot and there is no shade at the peak, so we started getting down to the fort ruins. Here we unpacked our lunch box and had sumptuous homemade lunch. 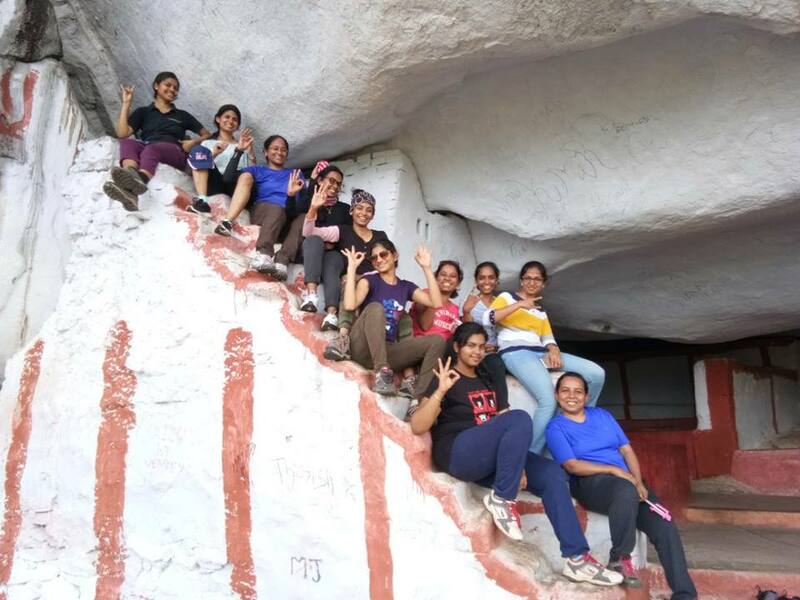 After grooving and moving to popular songs and clicking pics till the battery died down we started to descend. Descending was easy and we had lot of fun while descending too. By the time we reached the base – it started raining heavily and we all had got rain coats/umbrella. 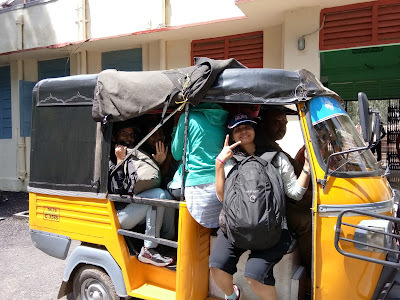 We took a bus to Bangalore from Rayakottai bus stand and had a feedback session in the bus. A big thanks to Shilpa and Bharti for organizing this trek, it never felt like you were organizing this for the first time. For the co-trekkers – you girls rock and each one of you are amazing souls. The endless chats, the swirls of laughter, the warmth, the friendliness of each one of you is cherish able. For the British conquering this fort was crucial to establish communication with Carnatic. 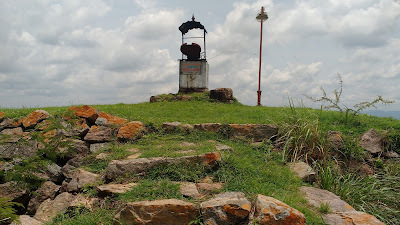 Though the Tipu’s garrison in the fort put up a stiff resistance, Major Gowdie bribed a local commandant and captured this fort during the third Anglo-Mysore war and this fort came into the hands of British. It could be seen that Tipu has built this fort meticulously planning two forts, one at the bottom and the other at the top, with intermittent water resources for the guards. 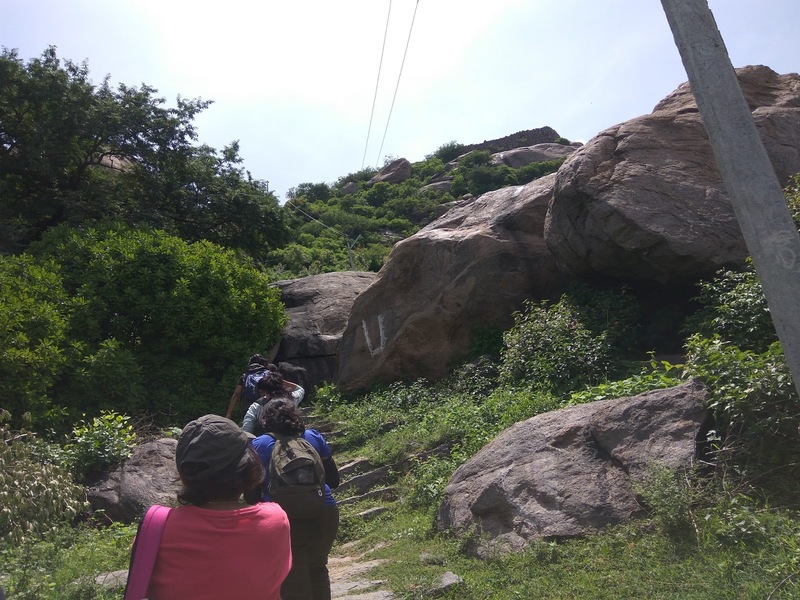 This is one of the ancient fortress of Krishnagiri district and now a protected monument by ASI.